Solid colour wardrobe with tongue and groove panels. Painted Starlight Pink to match other Armada Collection Furniture. Hidden handles to create a smooth and sleek finish. Providing ample storage with a half width hanging rail, pigeon hole shelving and one full width shelf. 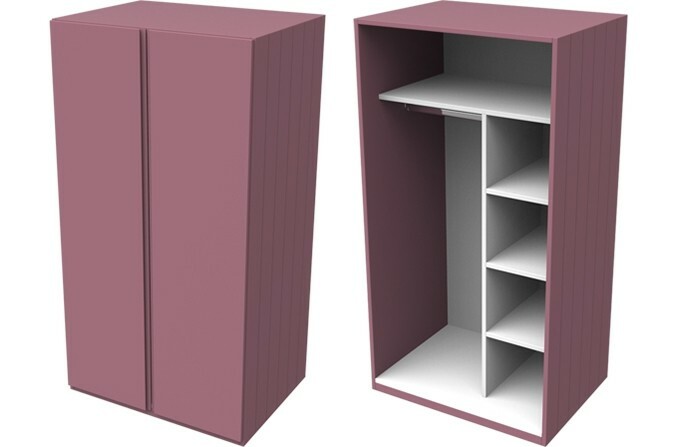 Small Kids Pink Wardrobe from the Armada Collection - Made from moisture resistant composite board, painted starlight pink to match other Armada Collection furniture. External panels are made with tongue and groove detail. Please measure to ensure this item can be carried from our delivery vehicle to the room you would like it positioning in.